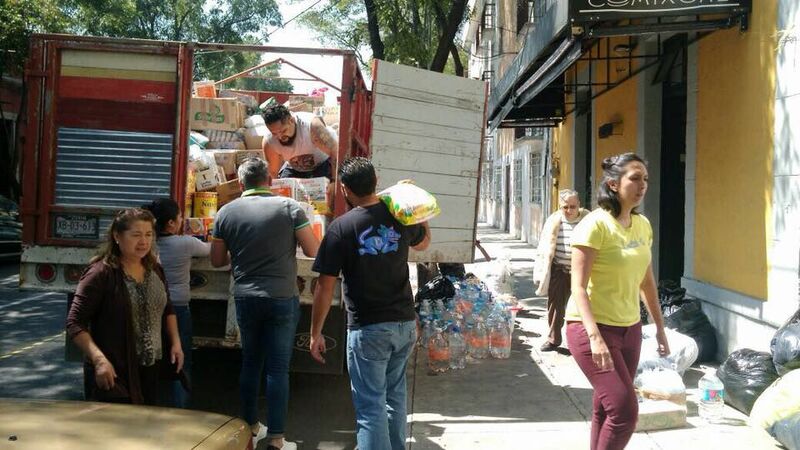 Toledo began collecting donations shortly after the quake to set up community kitchens in Juchitan, where more than 1,000 buildings, including city hall and a main hospital, were left in ruins. “The kitchens at least offer food so that (residents) can keep going,” says Toledo, who turned the patio of his house into a makeshift command center for food and supplies. So far, he has opened seven community kitchens that are serving up a menu of rice, beans, and tacos. Institutions including the Manuel Alvarez Bravo Photography Center, the Graphic Arts Institute of Oaxaca, and Juan Martin Gallery in Mexico City, and other artists have followed Toledo’s call to help. “I live in Mexico City, but we felt the magnitude of the quake and responded quickly,” says the Mexican artist Demian Flores, who helped to distribute around 10 tons of goods arriving by truck to Juchitan. “This is a good opportunity to invite all the cultural centers, all the spaces, museums, artists that want to come,” he says. “Reconstruction in Juchitan is going to be a long road.” Other who have pitched in include the Mexican poet Natalia Toledo, the writer Mardonio Carballo, and the musician Feliciano Carrasco. In a press release send on Friday, the country’s Culture Ministry said civil protection authorities were assessing the structural conditions of museums, but reported no damage at the Palacio de Bellas Artes and Museo Nacional de Arte in Mexico City’s historic center, and only light damage at archaeological sites in the southern region. But complaints have mounted over the government’s slow disaster response, and many locals continue sleeping in the streets to avoid living in now-rickety homes. “Right now, the immediate necessities are: food, jackets, small roofs, tents, medicine,” Toledo says. Toledo says he is also working on a series of prints inspired by the earthquake. An upcoming art auction organised by visual artists in Oaxaca will aid the recovery efforts. For more information or to make a donation to the fund, email the Friends of the Graphic Arts Institute of Oaxaca and Photography Center at donativoistmooaxaca@gmail.com.